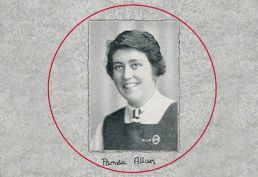 Pamela Allan was Head Girl in 1941 and served as President of the SMS Old Girls’ Association in the early 1950’s. Pam Allan served as President of the SMS Old Girls’ Association in the early 1950’s and has been an annual fund donor to the school since 1992. For her long career of service in nursing, commitment to lifelong learning and dedicated philanthropic giving, St. Margaret’s School is proud to present Pam Allan with a Service with Love Award.